Bringing cool space content into the classroom is an adventure I always look forward to. 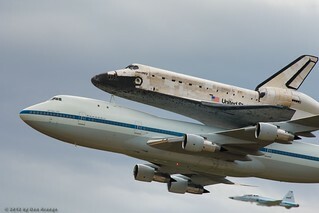 On Tuesday, April 17, the space shuttle Discovery flew from Kennedy Space Center to Dulles International Airport piggy-back on a modified 747. I thought about the three groups of students I was working with on ACT test prep and thought what a wonderful opportunity for them to see a space shuttle transported on a 747. My first question to establish prior knowledge was for them to list some things they knew about NASA’s space shuttle program. I received a few puzzled looks and several mutterings of “nothing,” which was not surprising to me. I asked for a show of hands in each class of how many students had seen a shuttle launch in their lifetime. Only two out of 78 students had seen a shuttle launch on television and only one had a fair amount of knowledge of a lot of things NASA but clumped it all together and asked me if the space shuttle was part of the Apollo thing. I would say there has been a major disconnect over the last forty years in teaching space science and history in our elementary and high schools but disconnect is not the right word. Absence is more aptly fitting. Whoever the curriculum developers have been over the years either were not interested or felt bringing space science and space exploration history into the curriculum would be too time intensive and take away from the core science fundamentals on space and our Solar System. Here’s what’s in a typical 6th grade science textbook. There are nine planets in our Solar System. 7th grade science moves on to genetics, cells, light, etc. but there is no continuation of learning about space or the wonders of our own Solar System. There is no mention of NASA, rockets, satellites, space exploration, Apollo, Mercury, Space Shuttle, astronomy, etc. Unless a teacher is aware of the cool technologies that will allow them to bring the excitement and wonder of studying and learning about space, the content will go undiscovered by millions of young people. I’m not sure if there has been a study that links what a student learns in elementary school to their desire to pursue a STEM career upon graduation from high school but I’m confident if more children were aware of and exposed to all the fantastic programs, online content, and missions, their would be a greater embracing of science and a quest to learn as much as they can about what lies up there. Space was always a curious topic for me. We didn’t cover much in my elementary school that dealt with space and I don’t remember my teacher telling all of us to go home and make sure we watched the landing of Apollo 11 and write a report that we could share with the class on our thoughts of a man possibly landing on the Moon. I watched the landing by myself in the living room of my grandmother’s house on a combination television/record player. The TV set was a piece of furniture in itself and the screen was located to the left of the console. The small black and white screen provided entertainment for me while I grew up and even though there was a larger b&w television in the family room I can’t remember how I ended up in the front watching the Moon landing. It was probably because when I told my grandmother that we had a space craft that was going to land on the Moon she dismissed me with a comment, “That’s impossible.” Then she went on to add her opinion that every time they (NASA) launched a rocket it tore a hole in the atmosphere and that’s why we often had violent weather. She basically declined to watch because she insisted for years that we never landed on the Moon. Her point was the entire landing as well as the Moon backdrop was a mock-up erected on the NBC set. “Look at the flag,” she pointed out. “It’s stuck in the air like a stiff board.” I was too little for her to take my explanation of the amount of gravity on the Moon did not let the flag drape on the pole like it did on earth. I didn’t know much about space weather at the time so I couldn’t explain to her why the flag wasn’t blowing in the wind either. Even as I grew older and our space program advanced, she still wasn’t convinced that we ever landed on the Moon and until she left us continued to believe that it was just too far fetched to be real. Fast forward to toady. We have a space agency that has completed some truly amazing engineering feats of marvel. We jumped into the space race and put a man in orbit in a relatively short amount of time. We evolved that space craft and sent a better one to space and eventually to the Moon. We stopped lunar exploration but there was still so much out there we didn’t know or understand. All the while our textbooks and schools continued to leave space exploration and space science beyond the basics, out of the curriculum. After doing workshops and presentations over the last ten years, I have not seen a vast improvement. Yes, we now have classes at the high school level that focus on space science. Many of my friends incorporate NASA content and missions into their science lessons but those of us who embrace teaching space are not the majority. 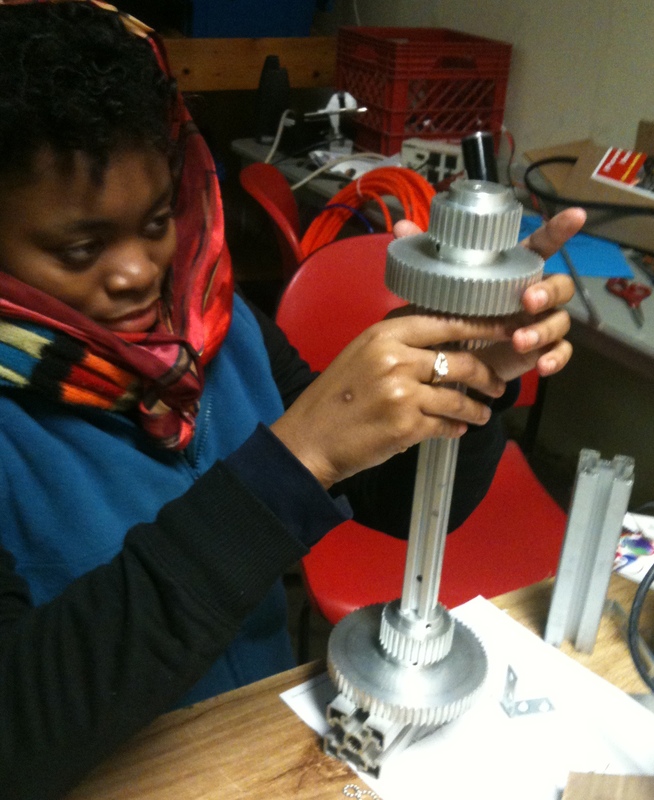 Our students are the lucky ones and in many cases we have been able to inspire them to become engineers, research scientists, physicists, astronomers, and perhaps even rocket scientists. As Discovery moves into the Smithsonian, a whole new generation of space lovers will have a chance to get up close and personal with her. Hopefully teachers will show space shuttle launches to their classrooms, talk about the importance of the space shuttle program and the advances it allowed us to make, and set the path for the future of human space flight and exploration where our young people will be poised to step up and fill the shoes of innovators whose time has come to pass the torch. In order for that to happen, we MUST engage, inspire, and educate our youth on what was, what is, and what is yet to come. We also need to make learning about space a necessity instead of a hobby or past-time. Every time I look at the stars or I see a bright twinkle that I recognize as a planet, I am awed and amazed. Viewing the Moon through my telescope still brings chills to me and when I take an image with a remote telescope I am inspired even more. This is the paradigm shift that needs to happen to encourage our youth to see space and dream to the outer limits but first we need to make sure we are sharing space goodness with everyone we come in contact with. That’s my charge of the day. Go tell someone to look up at night. Follow the Moon, identify some stars, look for the International Space Station. Save up for a ride on Virgin Galactic, dream to be an astronaut, or develop technologies for current NASA and commercial space missions. It is true that there are no limits on the imagination. Tuesday was the beginning of the celebration for the historic space shuttle Discovery. Providing oohs and ahhs as well as tears and smiles, Discovery, flyin atop a modified 747 from the Kennedy Space Center in Florida to Washington’s Dulles Airport, gave many their first glimpse at OV-103, curiosity seekers impressed at the attention taken away from so many daily lives to come out and spot Discovery, and others, such as astronauts, NASA employees, and a group of space tweeps to whom Discovery has a very special place in our hearts, a nostalgic walk down memory lane. @NASA asked their followers to post pictures they caught of Discovery as she flew overhead. The images are breathtaking and will be as lasting in our memories as the sight of Discovery launching into space over a 27 year time period and completing 29 missions. Discovery launched the Hubble Space Telescope and conducted the second and third Hubble service missions. In 1988, Discovery was the orbiter chosen to “Return to Flight” following the 1986 Challenger disaster and for the “Return to Flight” missions in July 2005 and 2006 after the Columbia disaster. Discovery also carried astronaut John Glenn on STS-95 who at the age of 77 showed the world he had the right stuff making him the oldest person to go into space. In my own memories of Discovery, I watched her launch on several missions in the NASA Aeronautics Education Laboratory with students acting as mission control specialists. I was there for her planned launch in November, 2010 only to watch days go by with continued technical problems causing several launch scrubs and quite a few disappointed space enthusiasts who left Kennedy Space Center without seeing her take her final flight. Fortunately many of us came back in February as part of the Neverending NASA Tweetup and finally saw Discovery take the sky. She did that one last time on April 17, 2012 on a piggy-back ride of a lifetime. The joy is by no means over. Thursday, April 19, 2012 will be Discovery’s entrance to the Smithsonian Museum’s Air and Space Museum. You can follow the excitement live from the Udvar-Hazy center as well as on NASA TV. I will be watching and living vicariously through the tweets and excitement of my fellow STS-133 tweeps who will be there in person and everyone else who will Discovery installed as a piece of living history for generations to come.